Biomaterial for filling and reconstruction of root canals - white based on MTA. Biomaterial for filling and reconstruction of root canals - white. The product is intended for use during dental treatment as a material for filling and re-mineralization of root canals. After mixing with the liquid Bio Mta + liquid, the working time is about 4 minutes, and the total binding takes about 2 hours, which allows you to end the treatment for 1 visit. 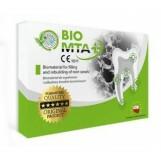 Bio Mta + has a remineralizing effect on tooth tissues due to the high content of calcium ions. Silicon-calcium compounds support the structure of tissues after wall perforation and intra-channel resorption. Bio Mta + is characterized by grain size expressed in nano-particles, additionally contains in its composition hydroxyapatite, which is a natural component of bones. By combining these two features, it exhibits excellent biocompatibility and allows full embedding of the material into the existing structure. After mixing Bio Mta + is characterized by extremely plastic, compact consistency, it is not loose. The product can be easily formed, which is important in a situation where there is a need to form an irregular shape. 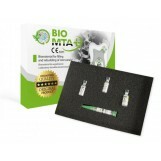 Bio Mta + sticks to a standard tool and can be placed on the channel. This enables a precise and controlled application and reduces the need to use expensive, complicated application tools. Bio Mta + exhibits 3x higher strength compared to traditional Mta type materials. This ensures strong and stable reconstruction. in the treatment of teeth with unfinished root development. Bio Mta + should not be used as a permanent permanent filling of the canal. Composition: Calcium oxide, hydroxyapatite and oxides of: silicon, iron, aluminum, sodium, potassium, bismuth, magnesium, zirconium, calcium phosphate. Pro 10 x 0,14 g Bio Mta + powder, 2 x 1 ml liquid, Matrix Mta +. after mixing with the liquid Bio Mta + liquid, the prepared dose should be used within max. 4 minutes - after this time, the resulting mass is hardened. PRODUCT FOR USE ONLY BY A DENTIST DENTIST.